PULLMAN, Wash. – Yong Wang, an internationally known researcher in the area of energy and renewable fuels, will join the Washington State University faculty as the first Voiland Distinguished Professor. Last year Gene and Linda Voiland donated an unprecedented $17.5 million to the School of Chemical Engineering and Bioengineering. The gift allows for the school to advance research and scholarship and to hire faculty in the area of new energy conversion technology. Wang, who received his master’s and doctoral degrees in chemical engineering from Washington State University in 1992 and 1993, is a leading researcher in the area of catalysis and biorenewable energy, where his prolific work has had a significant impact on improving energy efficiency, particularly in the chemical and fuels industries. Improving the efficiency of catalysts, which are used in many industries to chemically transform and create products and fuel, is an important factor in increasing supplies, reducing costs and improving environmental impacts of petroleum-based and alternative fuels. Wang’s work spans from fundamental to applied research in clean energy conversion including fundamental studies of structure and function relationships of transition metal oxide and bimetallic catalysts, development of novel catalytic materials, and innovative work in reaction engineering to improve the conversion of biomass and hydrocarbons to fuels and chemicals. He also developed novel and durable materials for fuel cell applications. 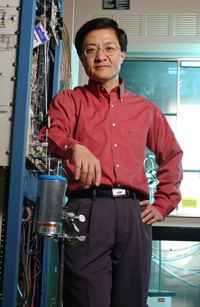 Wang joined Pacific Northwest National Laboratory (PNNL) in 1994 as a postdoctoral fellow. He became a research engineer in 1996, and by 2005 became a laboratory fellow- the highest scientific rank at PNNL. He established and managed a team of researchers focused on catalysis & reaction engineering from 2000 to 2007. In 2008, Wang became the associate director of the Institute for Interfacial Catalysis at PNNL. The institute works to develop and improve new catalysts to increase energy efficiency in a number of areas, such as the conversion of biomass to fuel. He was elected a Fellow of the American Association for the Advancement of Science (AAAS) in 2008 for his groundbreaking contributions to the fields of chemical reaction engineering and catalysis innovations. The Chinese Institute of Engineers also named him the 2006 Asian American Engineer of the Year. He is the recipient of three prestigious R&D 100 awards, which annually recognize the 100 most significant and innovative technologies that have been introduced in the marketplace. He is recipient of the Presidential Green Chemistry Award and was twice named PNNL Inventor of the Year. He was honored as a Battelle Distinguished Inventor and is also a first-time recipient of PNNL Laboratory Director’s Award for Exceptional Scientific Achievement. Wang has been honored as guest professor in many renowned universities and institutes such as the Dalian Institute of Chemical Physics. He currently serves on the editorial board of Catalysis Today and Journal of Nanomaterials. He also served as the Program Committee Chair of the ACS (American Chemical Society) Petroleum Division (2006-2008). He has organized numerous international and national conferences and has more than 130 peer reviewed publications, more than 60 invited presentations over the past five years, more than 100 issued patents, and six edited books and topic journals issued on novel materials and reaction engineering for fossil and biomass conversions. In recognition that the work he conducts will also have dramatic positive impacts on Washington’s agricultural industry, a portion of Wang’s appointment is also funded by WSU’s Agricultural Research Center, the state’s agricultural experiment station. “Our continued relationship with Yong will enable PNNL and WSU to work more closely together in the critical area of catalysis directed at increasing US energy supply and reducing green-house gas emissions,” said Ed Baker, director of the Energy and Efficiency Division at PNNL.